For the first time in its four years of welcoming riders from around the globe to Addison County’s world-class cycling routes, the Vermont Gran Fondo will invite cyclists to literally ride into the event’s après-ride party. Woodchuck Cider House at 1321 Exchange Street in Middlebury will be the staging ground for the Fondo’s start and finish onSaturday, July 1—and, from 2-7 p.m., the site of live music, farm-sourced food, and craft-brewed beverages. As part of the event’s registration fee, Vermont Gran Fondo registrants will receive tokens to redeem for food and drink. But friends and family, are welcome to join them and, if they’d like to share in what’s available, pay cash. Food purveyors will include the internationally inspired tacos of Caja Madera Food Truck; the pan-Asian delicacies of Thai at Home; homegrown pies from the NOFA-VT Pizza Oven; and the farm-to-spoon sweetness of LuLu Ice Cream. In addition to hosting and Gran Fondo founding sponsor Woodchuck Cider, two other local establishments, Lincoln Peak Vineyard (wine) and the Drop-In Brewery (beer), will be vending. Non-alcoholic drinks will be available too. Shane Murley and his six-piece band will provide music in support of the mellow, cool-down vibe. Riders who want to scrub up before enjoying the après-ride party can take a complimentary shower until 5:30 p.m. at Vermont Sun Fitness Center, just a few pedal strokes away at 812 Exchange Street. And a hose in front of the Cider House will be available for cleaning bikes post-ride. Registration fees are $125 for the Gran route; $115 for either of two Medio routes (difficile and facile); $80 for the Piccolo route—but rates will increase on June 16th to $140, $130, $85 respectively. In addition to après-ride food and drink, participants receive professional ride-day photography, SAG and mechanical support en route, well-stocked rest stops, and a Klean Kanteen stainless steel cup. Riders who upload their climb times to Strava will also have a chance to win KOM and QOM honors. The 2017 course raises the bar in difficulty. Maintaining the event’s base of four gaps, 100 miles and 10,000’ of vertical gain, the numbers have been pushed this year to 109 miles and 11,000’ vertical gain, while still maintaining four gaps climbs and descents. In addition to the traditional options of Gran, Medio and Piccolo routes; the Medio is now offered in two challenge levels (Difficile and Facile) with a choice of either Lincoln Gap or Middlebury Gap as the final hill climb. Lincoln Gap enjoys the status of being the steepest paved mile (Bicycling Magazine) in the U.S. as well as recently being named by Global Cycling Network as one of the nine steepest climbs in the world. With four route options riders sure to find a challenge to suit their ambitions. 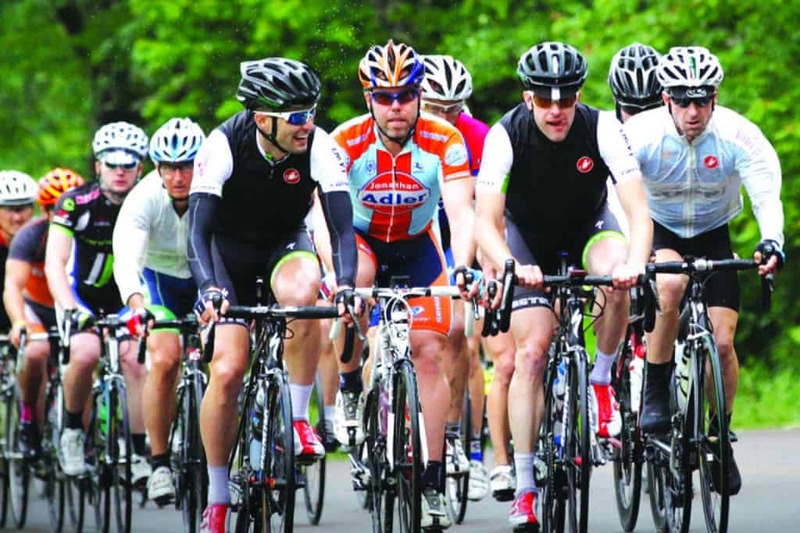 A gran fondo is a one-day bicycle event, first popularized in Europe, that emphasizes participation over competition. It’s typically characterized by a festive atmosphere, camaraderie, and post-ride food and drink. For more information and to register, visit vermontgranfondo.com. Cyclists ride the roads in Middlebury during the Vermont Gran Fondo race. This year’s course raises the bar.